Olaf Wieghorst (1899 – 1988) was a Famous American West painter. His artwork has been owned by the likes of U.S. Presidents Reagan, Ford, Nixon and Eisenhower; Senator Barry Goldwater, J. P. Morgan, Leonard Firestone, Gene Autry, Roy Rogers, Bing Crosby, John Wayne, Burt Reynolds and Clint Eastwood. I won’t do a lengthy review of his work, which is amazing. I saw a few pieces at the Desert Caballeros Western Museum in Wickenburg, AZ. 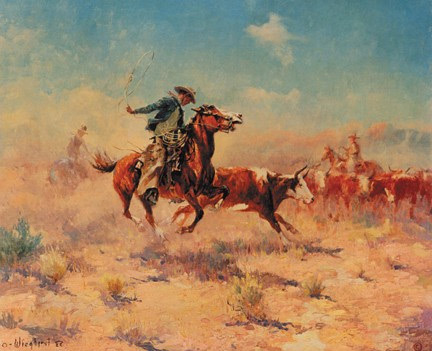 “Back to the Herd” — This mounted cowboy swinging his lariat is riding hard to bring a straying horned steer back to the herd. Olaf was a master at displaying the horse in action as portrayed in this painting.